Researchers at the University of California, Irvine, under the direction of Dr. Ira T. Lott, are recruiting adults (age 18 and over, both female and male) with Down syndrome for the study, titled “Brain Aging and Dementia in Down Syndrome.” This study is funded by the National Institute on Aging. People with Down syndrome comprise a special population of individuals at risk for Alzheimer’s disease type dementia. The purpose of this study is to improve our understanding of brain aging and dementia in Down syndrome. Participation in this study will require yearly visits which consist of medical evaluation, neurologic evaluation, and assessments measuring your memory, thinking, and functional skills. The research visits will be conducted at the UC Irvine Institute for Clinic and Translational Science which has offices at both the UC Irvine campus in Irvine and the UC Irvine Medical Center in Orange. Participants can choose the research site of their preference. Each visit is expected to last approximately four to five hours. The evaluations in the study will be provided to participants at no cost. There are no direct benefits of participation, however, the participant themselves, other individuals with Down syndrome, or the population as a whole may benefit from the conclusions drawn from the results of this study. Participants will not receive any compensation for their participation. 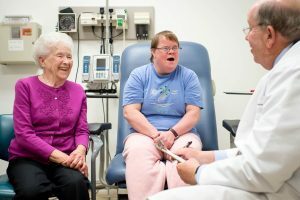 Researchers at the University of California, Irvine under the direction of Dr. Ira T. Lott, are seeking healthy adults with Down syndrome to participate in a research study about brain aging and Alzheimer’s disease. People with Down syndrome are at significantly increased risk to develop Alzheimer’s disease by age 40 years. The study, entitled “Biomarker of Alzheimer’s Disease in Down Syndrome” will investigate biological factors that may be related to the development of Alzheimer’s disease in adults with Down syndrome. These biomarkers are likely to be important for the discovery of future therapies. Approximately 100 adults with Down syndrome are sought to participate in the study. To be eligible, participants must have Down syndrome (with or without Alzheimer’s disease), and be age 40 or older. Study participants will be involved for a total of approximately 3 years of evaluations. During this time, participants along with their caregivers or family members will be asked to attend a total of 6-8 visits lasting 2-8 hours each over the study period. Participants in this study may not receive any direct benefit to participation. Medical evaluations will be available to the participant’s physician. This study parallels research in Alzheimer’s disease within the general populations with a specific focus on Down syndrome. The evaluations in this study are provided to participants at no cost. Participants will be compensated up to $310. 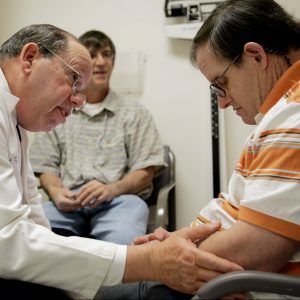 Caring for someone with Down syndrome who exhibits symptoms of Alzheimer’s disease? Attend a free monthly education and support group for family caregivers of individuals with Down syndrome who are concerned about Alzheimer’s disease. 3rd Tuesday of Every Month @ 10:00 – 11:30 a.m. Program provided by Alzheimer’s Orange County, Regional Center of Orange County, and UCI MIND Down Syndrome Program.